Viper Extreme Bars from Maximuscle have been around for a few years now. 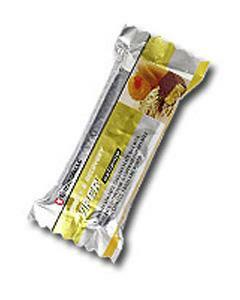 We (Gymratz) have never actively sold them as there seems to be very little demand carbohydrate "energy" type bars. Due to a few requests for the bars from customers making up orders from our Trade Price Supplements site we have decided to keep them in stock, hence the appearance within this supplement section. 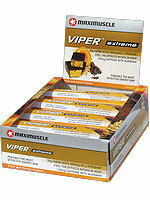 Viper Extreme Bars Possibly the strongest stimulant* & energy bar in existence - feel it work fast! Maximuscle Viper Extreme� bars are considered the most powerful stimulant* and buzz bar available on the market. Its exclusive and unique formulation should provide you with a powerful mental and physical buzz in about 15-30 minutes of eating it. Maximuscle Viper Extreme bar is made from a delicious blend of fruits and grains blended for long lasting energy. To make sure the formula really gives you a kick, you get an amazing 5mg of guarana, 139mg caffeine and 1035mg of L-Tyrosine, a very potent excitatory brain amino acid. Within 30 minutes of taking this great bar, many people feel more awake, vibrant and ready to tackle the most intense training sessions, long work days and more. Never before has such an impressive combination been put into a bar before. Please note: these bars taste great and it is therefore very tempting to eat quite a few, never consume more than 3 a day and not 4-5 hours before bedtime!